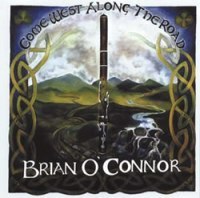 Brian O'Connor-"Come West Along the Road"
1) Mulqueeney's - Breton Tune. 2) Sonny Brogan's - Doherty's. 3) The Golden Eagle - City of Savannah. 4) The Cuckoo - In the Nip. 5) J.O.Forbes Esq. of Corse. 6) Leather Away the Wattle O' - The Spent Money. 8) The Rubber Man - The Iron Man - The Derry Hornpipe. 9) Cornphiopa Corafinne - The Blackbird. 10) The Dear Irish Boy.